Since its launch in summer 2013, the Small World Initiative (SWI) has expanded from a small “Microbes to Molecules” course at Yale University to a multi-institutional (60 institutions in 5 countries) organization with more than 2000 students and alumni. Professor Jo Handelsman and colleagues at Yale pioneered this ambitious organization with an innovative approach to STEM education in response to a worldwide health crisis. The SWI seeks to harness the collective power of student researchers across the globe to discover new antibiotics from soil microorganisms, living up to its motto “crowdsourcing antibiotic discovery”. The program offers undergraduate students an authentic research experience, built into first- and second-year life science courses, where they explore the biological and chemical diversity of local soil environments. 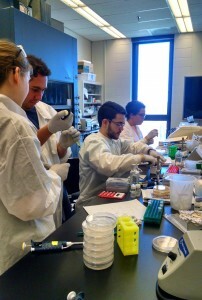 While antibiotic discovery and development take longer than a semester, the collective effort of many students increases the chance of identifying potential candidates for new drugs. Professor Handelsman, who is currently on leave from her faculty position at Yale, has become a strong voice for the antibiotic crisis and the need for new strategies to combat resistance. Her current position as Associate Director of Science at the White House Office of Science and Technology Policy aligns with the SWI’s commitment to STEM education, scientific research, and science diplomacy. Funding for the first two years of the SWI was provided by the Leona and Harry B. Helmsley Charitable Trust. This spring 2015, the SWI will be holding its second annual symposium and conference at the American Society for Microbiology Conference for Undergraduate Educators (ASM-CUE) in Austin, TX from May 28 to 31. Pilot Partner and head of the Symposium Committee Jean Schmidt from the University of Pittsburg organized the event. Partner Instructors from the U.S. and Canada will each bring one or two undergraduate students to share research findings, promote ongoing curriculum development, and make plans for 2015-2016. Just after ASM-CUE, the SWI will hold the 2015 Training Workshop. This event will take place at National University in Costa Mesa, CA from June 2 to 6. Contact Pilot Partner and SWI regional leader Dr. Ana Barral (abarral@nu.edu) to request an application (the deadline is May 1). The hands-on workshop will train participants in the experimental setup of SWI as well as promote discussions on course design and assessments. Research scientists and educators with an interest in microbiology and undergraduate STEM education are encouraged to apply. In March 2015, the Society for General Microbiology (SGM; UK-Ireland) announced the launch of their Small World Initiative at their annual conference. The SGM-SWI will expand the current focus on undergraduate classrooms to include high school partnerships and the general public with a Citizen Science component. Further details for interested parties in the UK and Ireland can be found at the SGM website. Finally, the SWI is partnering with the American Society for Microbiology (ASM) to offer a workshop for Iraqi educators that will be held at the Jordan University of Science and Technology from June 7 to 11. Summer 2015 marks the third year that SWI has been in operation. 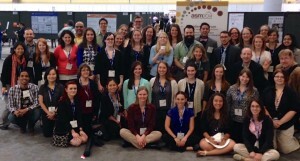 The SWI Committees, led by the Pilot Partners and collaborators, have taken great strides in the past year to create curriculum packages, curate research and teaching materials, evaluate student outcomes, organize outreach events, and now, focus on training the second generation of Partner Instructors. Last year, the SWI welcomed 36 new instructors, expanding the network to Puerto Rico, Canada, the U.K., Belize, and Malaysia. The SWI website is the best starting point for those interested in joining the community and participating in the SWI. On the website, registered users can access manuals, protocols, and implementation resources, as well as contact information of other partners and collaborators. Users will be able to upload data into the SWI’s online repository and view other participants’ results. In addition, the website will connect users to the SWI Facebook group, which provides an interactive and “in the moment” forum for instructors and students as they perform the research workflow each semester. We look forward the next generation of SWI Partner Instructors and collaborators who will pledge to join our mission to transform STEM education and promote antibiotic discovery using curiosity and creativity of young scientists across the world. Simon A. Hernandez is a Postgraduate Associate in Jo Handelsman’s Lab and the Center for Teaching and Learning at Yale University, and Communications Manager of the Small World Initiative. Contact him at simon.hernandez@yale.edu. Nichole A. Broderick, Ph.D., is a Co-Lead Research Scientist in Jo Handelsman’s Lab and lecturer of Small World Initiative course at Yale University. For more information about the getting involved, please contact Program Coordinator Todd Kelson (kelsont@byui.edu) or Regional Leader and host of the 2015 SWI Training Workshop Ana Barral (abarral@nu.edu). To meet us at the ASMCUE 2015 Meeting, please contact Pilot Partner and Symposium Coordinator Jean Schmidt (schmidtj@imap.pitt.edu). Nichole Broderick is a microbiologist at Yale University working on the Small World Initiative. I am interested in the up-coming Workshops offered by PULSE. I would appreciate if you could kindly send me the details. Here is the website for more information (http://www.pulsecommunity.org/group/southwest-pulsers/forum/topics/yale-s-small-world-initiative-looking-for-partners). You can contact Ana Barral (abarral@nu.edu) to register.